An investigation by BBC East has revealed the huge proportion of cases of psychosis involving young people who have been using cannabis. Cambridgeshire-based medical unit, Cameo, which specialises in helping people aged between 17 and 35 who are suffering from the early stages of psychosis, has said about 80% of its clients are heavy cannabis users. The project has had 75 referrals for the south of the county this year and its new office in Peterborough has had 39 referrals since September. Prof Peter Jones, Cameo's co-director, told the BBC: "We found that when we looked at 100 consecutive young adults coming to the Cambridgeshire and Peterborough Trust first episode psychosis service, 80% were either dependent on cannabis or using it heavily." He has said that the proportion of his patients who are chronic cannabis users has increased in the last ten years, and that "it's now exceptional if people aren't using cannabis". 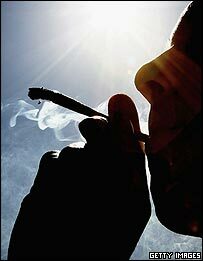 The problems of cannabis-linked psychosis are also being felt in the criminal justice system in Cambridgeshire. Andy Cave, one of only two specialist mental health lawyers in the county, said almost all his young clients had fallen foul of the law because of psychotic episodes caused by cannabis. "Some people using cannabis for a long time and see no ill effect - some people can use cannabis once and go into a mental health psychosis which could land them in a very serious situation in court, or, on many occasions lead them to an admission to a hospital and that admission has to be compulsory, and they are detained," he said. In Peterborough, some community workers believe that a particularly strong strain of the drug may be behind a recent spate of violent incidents. Staff at the Peterborough Foyer, homeless hostel, said in the last month at least 10 of its 50 clients suddenly started to suffer from hallucinations and became aggressive. All had been smoking cannabis. Phil Estell, hostel manager, said: "There were one or two people who became so psychotic they didn't actually realise what they were doing. "One's now been evicted and the level of violence from that person was quite dramatic to the extent that the person was carrying a baseball bat and was ready to use it." Recent research at the University of Maastricht has suggested that heavy cannabis use in adolescence and young adulthood moderately increases the risk of developing psychosis, though it is greatly increased in those people already predisposed towards such problems. This is compounded by the emergence in recent years of stronger varieties of cannabis, known as skunk. Prof Peter Jones said: "It certainly complicates psychosis once its already established, but it's a bit more complicated in terms of whether it would have either triggered or led to psychotic disorders in people who weren't going to get them anyway - I suspect that it does in some cases." Prof Jones also sits on the Advisory Council for the Misuse of Drugs, which meets in January to re-consider its position on the classification of cannabis in the light of the emerging evidence linking it to mental illness. "The problem with the classification from B to C is that the message went out that this had become a legal drug when it wasn't legal at all," he said.